Mom’s employer, Mr. Andy, asked if Mom wanted to take care of Austin this weekend. 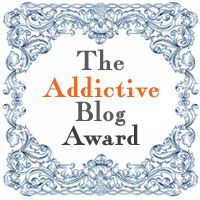 Of course, Mom jumped at the chance. Armed with the house key and a security review, she looked forward to her first visit of the weekend after our evening constitutional last night. 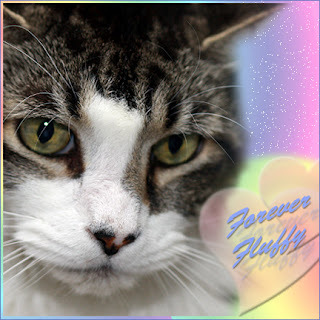 Mom wondered if Austin would remember her. Austin greeted her in fine golden fashion with barks and major wagging. His tail wagged so hard and fast the back half of his body had to compensate in the opposite direction! He looked like he choreographed a Latin Salsa! After a quick “empty the tank”, Mom decided to see if they could play inside since she arrived after dark and she couldn’t find her light stick at home. Of course Mom sat on the floor and gave Austin a proper “hello, great to see you again” back massage and major belly rub. 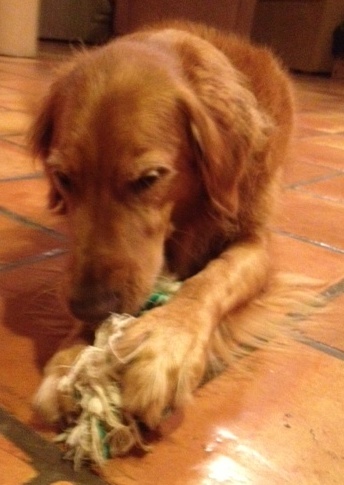 Then, she told Austin to, “bring me a toy.” Wagging. Go ahead Austin, “where’s your toy?” Wagging. 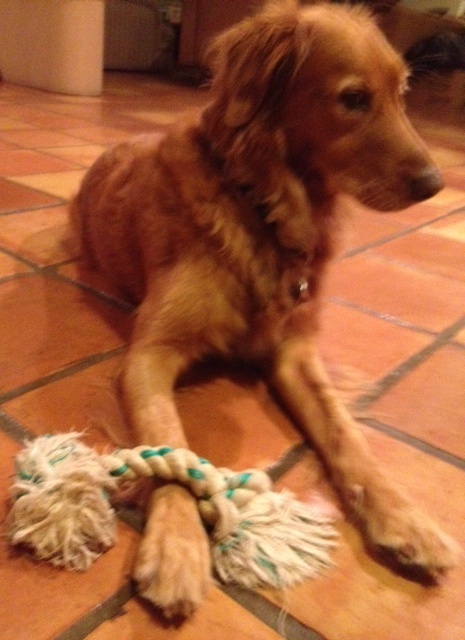 “Austin, let’s play rope… do you still have your rope?” Austin reversed and went off to the family room and trotted back with his prized rope! You may recall this is the toy Mom purchased for him during “Olympic Dog Sitting Week!” I bet if I saw Mom at that moment, I would have seen a humongous smile on her face. 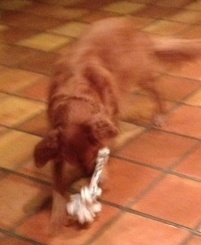 Oh they had fun playing tug, fetch, with intervals of Austin playing with the rope and Mom taking pictures. Mom transcribed a text from Austin to his human parents letting them know he felt comfortable with Mom and enjoyed seeing her again. Sorry we missed you yesterday, Mom ran around from appointment to errand to appointment to errand, etc… you get the drift! One of those appointments was taking JJ to Dr. Shaffer (who as we’ve mentioned before has his office at the end of the earth aka far away). Great news! JJ’s ears have FINALLY improved. She’s down to maintenance medicine 2x/week in the ear which had the procedure and once a week in the other ear. Phew! I digress. Mom took JJ to PetSmart across the street and I can’t believe what she did! She bought toys for Austin (very nice) and NONE FOR CASA JET!!!! JJ didn’t seem to mind, she was way more interested in the humans. 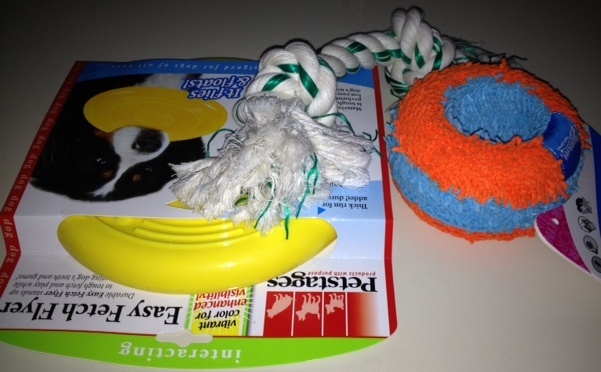 Mom felt Austin needed the basics: a tug toy, an indoor fetch toy and another frisbee, his favorite outdoor toy. 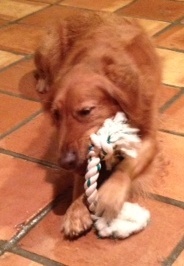 Last night, after their evening constitutional, she surprised him with the tug toy. She told us he wagged so hard she thought his tail might fall off! 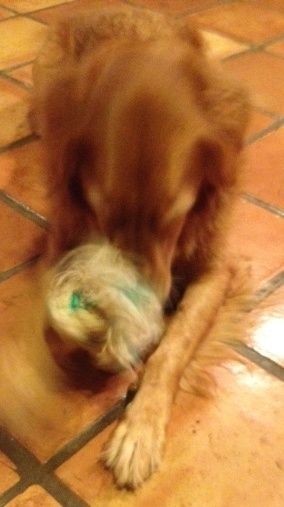 He fetched, he tugged with Mom and didn’t let the toy out of his sight. 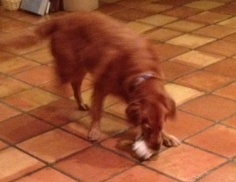 When Mom returned for turn down service, Austin met her at the door proudly showing off his new toy. He easily surrendered the rope while he went outside for last potty and then sat with his tail sweeping the floor patiently waiting for Mom to throw the rope for another round of fetch. Mom helped him learn that she would give bedtime belly rubs while he held the rope in his mouth. Once he figured that out, he relaxed and almost fell asleep. No doubt he dreamt of open fields with lots of tug toys to fetch! Another great tug toy day.